About 70% of the bee species in the U.S. raise their young in underground tunnels. These ground-nesting pollinators select loose, well-drained soil in open, sunny sites. Tunnel entrances are holes about the diameter of a pencil. Entrances are surrounded by wide rings of fine soil brought up as bees extend the tunnel and develop brood chambers (Figure 1). 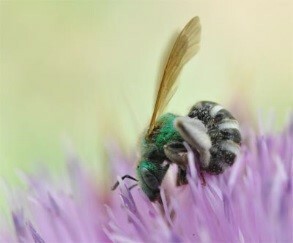 These solitary bees build individual nests. Over time, dozens to hundreds of holes may occur in preferred nesting sites. Females can sting but do not aggressively defend their territories. Stinging incidents usually result from handling or accidentally stepping on the insects. Some ground bee species resemble honey bees, while others are brightly marked. Most are active for a few weeks in spring and then disappear until the following year. 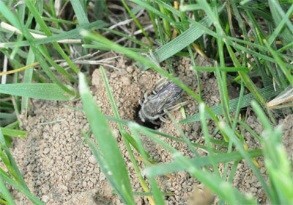 Bees nesting in locations that cause problems may be forced to move if soil is kept wet.